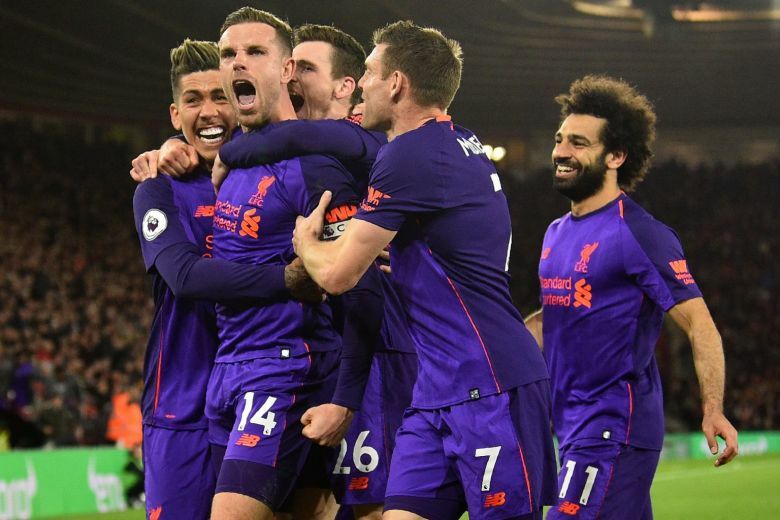 Late goals by Mohamed Salah and Jordan Henderson earned Liverpool a crucial 3-1 victory at Southampton to move them back to the top of the Premier League on Friday (April 5). For the second week running Liverpool looked like losing ground on Manchester City in a titanic title race, but once again Juergen Klopp’s side would not be denied as they edged a step closer to a first league title since 1990. With games running out they lead City by two points, although Pep Guardiola’s champions have a game in hand. Locked at 1-1 Liverpool were laying siege to the Southampton goal but it was Salah, who had not scored for eight games, who provided the moment of magic they desperately required in the 80th minute, racing away to score a majestic solo goal. It was Salah’s 50th Premier League goal for Liverpool and six minutes later Henderson, on as a substitute, wrapped it up with a close-range finish. Shane Long had made it a nail-biting night for Liverpool’s massed ranks of supporters when he fired relegation-threatened Southampton ahead in the ninth minute. Victory lifted Liverpool to 82 points from 33 games, with City on 80 from 32. “It was very big. Every game is massive. We’ve got to win every game. I thought we showed great character in the first half,” Henderson told Sky Sports. Liverpool needed a stoppage-time winner to beat Tottenham Hotspur 2-1 at Anfield last weekend and they were forced to do things the hard way again at St Mary’s. They were caught cold early on and Long punished them, calmly firing home after Ryan Bertrand’s cross was flicked on. It could have been worse with Long almost making it 2-0 but Keita’s header calmed the nerves in the away ranks. Liverpool dominated after the break but Southampton defended tenaciously, even if they were lucky when Maya Yoshida appeared to bring down Keita in the penalty area. An ecstatic Klopp joined in the celebrations on the pitch with his players who face Chelsea at home next week. “We have 82 points now, that is massive in this crazy league and everyone is waiting for us. I am really proud. It is incredible,” the German said.